We do know that a comprehensive immigration reform bill will soon surface. The trouble is, we don’t know what it will contain. President Obama granted two interviews to Spanish language networks, Univision and Telemundo, yesterday, using the opportunity to talk about a still-elusive comprehensive immigration reform bill. It has been assumed that the Senate will introduce its bill after lawmakers return from recess the second week of April—so it was no surprise to hear Obama mention introduction of the bill is imminent. More newsworthy is how little the president had to say about what the bill will contain, particularly when it comes to guest workers. Four of the Senate’s Gang of Eight lawmakers, who have been hammering legislation for months, visited the southern border yesterday in Nogales, Arizona, during what seemed like a made-for-social-media moment. Senator John McCain tweeted that he witnessed a woman make her way over the separating fence, and then tweeted that although she was apprehended by Border Patrol, the “incident is another reminder that threats to our border security are real.” It’s unlikely that the woman in question was any kind of security threat—but what happened does illustrate that the record number of nearly 22,000 border agents, aided by airplane and drone surveillance, are monitoring the border with unprecedented success. In his interviews yesterday, Obama once again drummed up support for border security in any upcoming legislation, though it hardly seems necessary to do so. At a naturalization ceremony at the White House on Monday, Obama once again called attention to the need for “sensible immigration reform.” The twenty-eight people who attained citizenship Monday included several servicemembers—who often easily fit into the “deserving immigrant” narrative. In his interviews yesterday, Obama talked about an earned and even “tough” pathway to citizenship, which some fear will leave those with limited English language skills or minor criminal conviction out of upcoming legislation. But what remains perhaps most troubling is Obama’s stance—or lack of one—on a guest worker program. Telemundo’s Lori Montenegro directly asked the president whether such a program threatens moving forward on immigration reform. Obama essentially evaded the question by talking about the border and citizenship instead, and was altogether ambiguous about any details. It’s impossible to imagine that the president doesn’t have a better sense of the bill. After all, Senator Chuck Schumer, who also visited the southern border yesterday, is a top-ranking Democrat working on the legislation who’s close to the president. The guest worker issue is an important one. 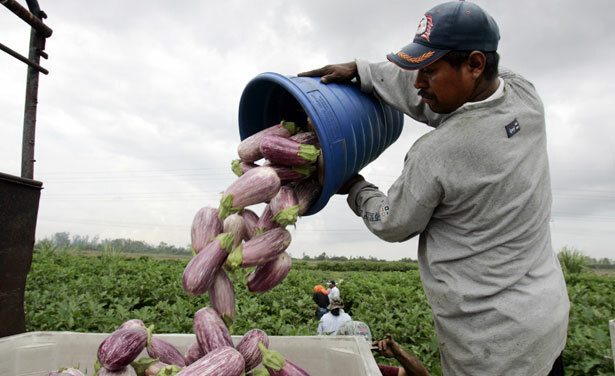 Labor and immigrant rights groups know that such a program not only subverts the power of US workers but also welcomes the exploitation of foreign workers. As the Southern Poverty Law Center outlines, guest workers are often not paid the wages they’re owed, are effectively confined during their time in the United States, and live in ramshackle housing. Guest workers are tied to their employers, who can make the unilateral decision to send them home at any time. Josh Eidelson has been covering the way that McDonald’s has been exploiting student workers on visit for educational exchanges. Organized by the National Guestworker Alliance, these student workers are trying to put a face on a perennial problem that most people rarely hear about: essential workers who cannot enjoy basic worker protections. Obama’s remarks on immigration this week signal an increased and gratuitous focus on border security, and on marking a distinction between deserving and non-deserving immigrants. His silence on guest workers indicates upcoming legislation may have to do more with who’s being left out than who’s been welcomed in. As the Iraq War passes the ten-year mark, read Tom Engelhardt’s take on the imperialist anniversaries you may have missed.